Prof. Alexa has been elected to the executive board of the Hybrid Plattform. He had been active in trans-disciplinary projects for years, strongly believing that this keeps science and research well-grounded. 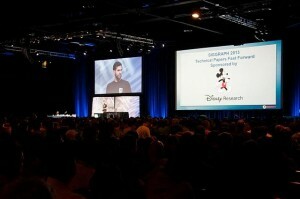 Prof. Alexa had been elected to chair the technical program of SIGGRAPH 2013. SIGGRAPH regularly gathers thousands of scientists and professionals in the visual effects industry, and its technical program is the most prestigious and selective in the field. On the left, he opens the fast forward, a 30 second presentation for each of the accepted papers. The Dagstuhl seminar on ‘Computational Aspects of Fabrication’ organized by Alexa, Bickel, Matusik, McMains, Rushmeier has been accepted. More information here. We develop a system for 3D object retrieval based on sketched feature lines as input. For objective evaluation, we collect a large number of query sketches from human users that are related to an existing data base of objects. The sketches turn out to be generally quite abstract with large local and global deviations from the original shape. Based on this observation, we decide to use a bag-of-features approach over computer generated line drawings of the objects. We develop a targeted feature transform based on Gabor filters for this system. We can show objectively that this transform is better suited than other approaches from the literature developed for similar tasks. Moreover, we demonstrate how to optimize the parameters of our, as well as other approaches, based on the gathered sketches. In the resulting comparison, our approach is significantly better than any other system described so far. Humans have used sketching to depict our visual world since prehistoric times. Even today, sketching is possibly the only rendering technique readily available to all humans. This paper is the first large scale exploration of human sketches. We analyze the distribution of non-expert sketches of everyday objects such as ‘teapot’ or ‘car’. We ask humans to sketch objects of a given category and gather 20,000 unique sketches evenly distributed over 250 object categories. With this dataset we perform a perceptual study and find that humans can correctly identify the object category of a sketch 73% of the time. We compare human performance against computational recognition methods. We develop a bag-of-features sketch representation and use multi-class support vector machines, trained on our sketch dataset, to classify sketches. The resulting recognition method is able to identify unknown sketches with 56% accuracy (chance is 0.4%). Based on the computational model, we demonstrate an interactive sketch recognition system. We release the complete crowd-sourced dataset of sketches to the community.